In honor of yesterday’s National S’mores Day and the fact that today is National Book Lovers Day, I present to you a cookbook that encompasses the best of both holidays: Campfire Cookery: Adventuresome Recipes and Other Curiosities for the Great Outdoors by Sarah Huck and Jaimee Young. I know many of you CSAer’s love to camp and if you love the wonderful bounty of delicious vegetables that is the Southside CSA, chances are you aren’t going to be happy eating hot dogs and ramen noodles for an entire weekend (not that there’s anything wrong with that). 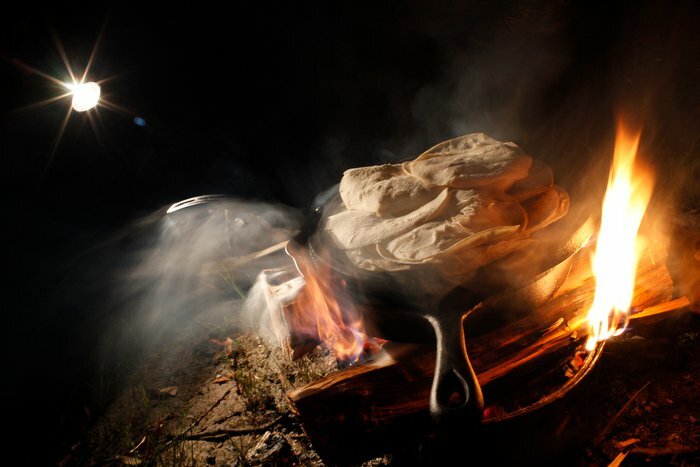 This book is worth taking a look at to inspire some incredible campfire meals. Eight of us Southside CSAer’s (and two misfits from another csa) went to Cedar Point Campground in Long Island for Memorial Day Weekend and brought this book with us to test out some of the recipes. The verdict: pretty great, but our own recipes are even better. The biggest downside to this book is the lack of vegetarian-friendly options. 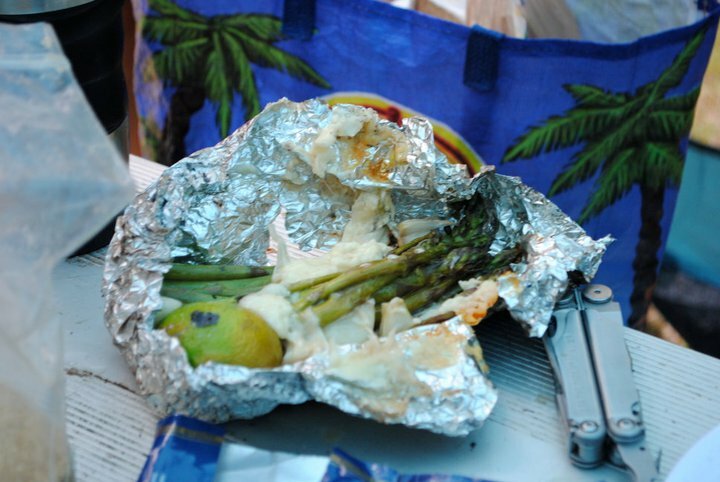 Most of the meals are heavily meat-based and although I love to eat meat, I love camping with my vegetarian friends even more. We were able to try a couple of the breakfast meals because they did not rely on meat. Off-to-the-Races Porridge was a great way to spice up your typical boring campfire porridge dish with some raisins soaked in liquor, bananas, apples, cream and Circle C Maple Syrup. Bananas Foster Pancakes with beans... in the rain. Photo courtesy Ryan the Girl. 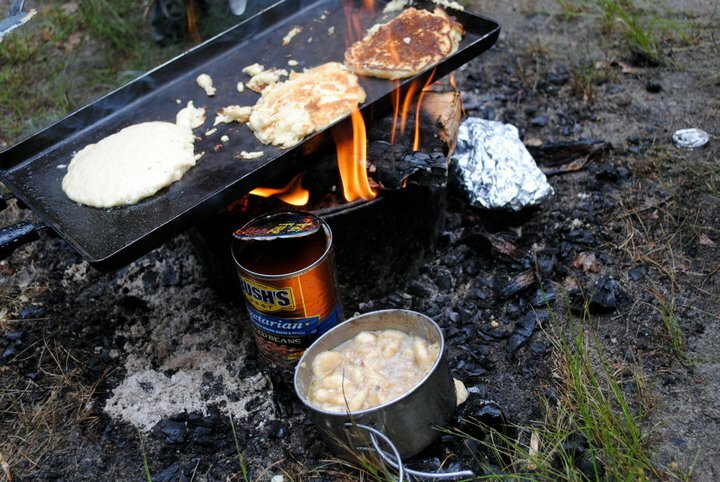 Bananas Foster Pancakes also feature liquor in them- the authors of this book obviously know how to start out a camping day! The tricky part is making sure your friends don’t drink it all the night before, but once you secure the last of the bottle and soak it in bananas with walnuts, they really will be grateful to you in the morning. There are a couple of other recipes I’m hoping to try out at some point: the Carmelized Tomato Tarte Tartin and Foil-Roasted Mushrooms both sound delicious, practical and veg-friendly. The majority of the recipes in this book will honestly be a bit too labor intensive and ingredients will be difficult to find in your average rural grocery store; most of the recipes are perhaps are best suited for people with backyard bbq pits. My favorite example is the recipe for Sweet Cinnamon Beignets (seriously!). All I know is that I don’t want to be on dish-washing duty for that camping meal. 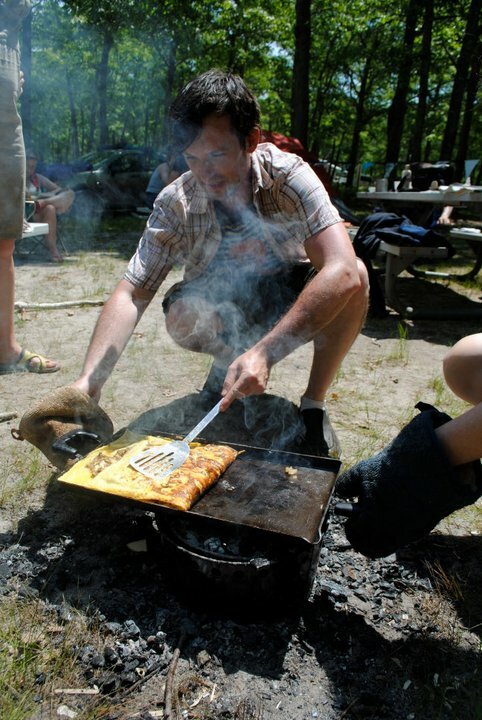 There are also instructions for campfire baking which, although a cool idea, it seems easiest to bake cookies at home and bring them on your camping trip as opposed to trying to mimic an oven using coals and aluminum foil. The highlight of this book? The full spread of s’mores variations on pages 247-8. I won’t give away all of them, but we tried almost every variation and they are all amazing. We adapted the Grasshopper S’more with Junior Mints and I’m happy to say this has now become a camping tradition. This book also features some cool additional camping material that is worth taking a look at. A Connoisseur’s Guide De Bois, a guide to Spirit-Awakening Seances and Essential Philosophical Quandaries to discuss over the campfire- all of this material is fun and cute even though we didn’t try any of them since we were too busy playing Werewolf. Although this book is not available at Brooklyn Public Library, I was able to get a copy at New York Public Library. It’s also on sale right now, but if you are a serious tent camper, I would check it out of the library first to make sure there are enough recipes in here to make it worth your $$$. 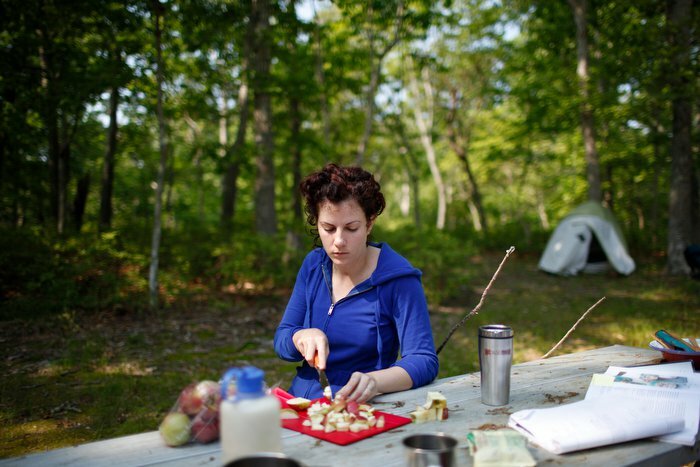 In the meantime, we’ve realized that we should probably publish our own camping cookbook with delicious and practical recipes that actually can be cooked in the middle of nowhere. So if any publishers or agents out there are reading this and interested, you know where to find us. 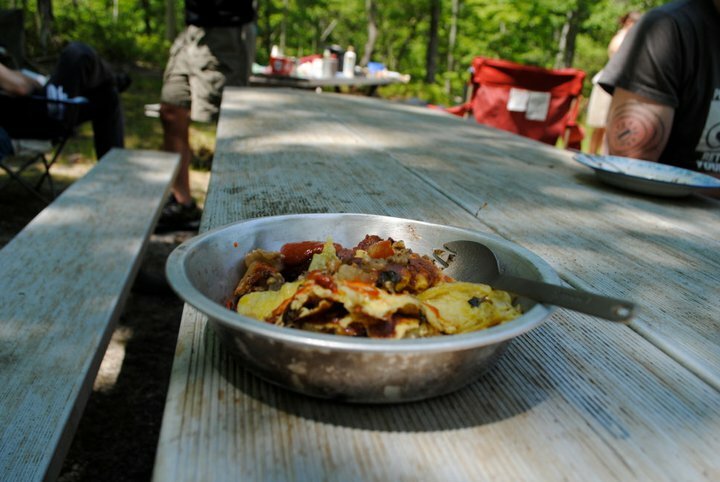 camping breakfast csa style- yay!